Les Contamines is a beautiful and very authentic village high in the Mont Blanc region of the French Alps. Unlike its more famous neighbours (Chamonix and Megève) Les Contamines has resisted any large scale expansion and has therefore retained a lovely, traditional mountain feel. The village sits at around 1100m and is mainly comprised of sensitively restored farm buildings around a charming village centre. With Mont Blanc in the distance, the nearest mountains are l’Aiguille Croche and Mont Joly both of which soar to 2,500m. The beautiful mountain pastures and majestic forests which surround the village offer a whole range of delightful family walks. The Tourist office has produced some very detailed guides to lots of these walks so less chance of getting lost! If you prefer to walk at height, the Gorge and Signal cable cars remain open throughout the season to whisk you up to the higher walking routes. In fact, there are over 120kms of marked paths and trails to satisfy walkers of all abilities including a couple which can be accessed by wheelchairs and buggies. If you want to head off the beaten track, knowledgeable local mountain guides are on hand to help you plan longer adventures. Mountain bikers are also well catered for with lots of varied terrain for you to explore. There are 6 marked routes from the village and more can be accessed at the summit of the Gorge or Signal cable cars. A popular for many is ‘Les Clarines’, an exciting 3.2km track which winds down the mountain encompassing four thrilling fun zones with obstacles for the brave to tackle. Flight times from the UK are around 90 mins and your best arrival airport is Geneva which has a transfer time of around 75 minutes to the village. The proximity of Les Contamines to the Mont Blanc tunnel means that the northern Italian airports are also viable travel options. En route to Les Contamines you can admire Mont Blanc in all its glory (well weather depending obviously) before embarking up the road to the sunny L’Arve valley. When you hit the end of the road you will know you are in les Contamines surrounded by beautiful alpine and non alpine peaks in all directions. Why not let Peak Transfer do all the hard work for you this summer by taking advantage of our low cost, reliable private transfer service to Les Contamines. With your very own dedicated driver ready to meet you when you arrive at the airport you can simply put your feet up, and before you know it, you will at your accommodation door. Travelling with Peak Transfer will mean you will travel with peace of mind knowing that with our internationally qualified professional drivers and fully licensed vehicles you will be in safe hands. This plus our complimentary SMS confirmation service where your driver’s name and contact details will be sent to you 24-hours prior to travel takes away some pre-travel stress that can affect us all. Peak Transfer do not charge extra for luggage (including skis, snowboards and bikes) or for the use of our fully safety rated booster, child or baby seats. To find out more about Peak Transfer, make an enquiry or to get a quick quote online visit our website here. What to eat & Where to eat it! For a village of its size, Les Contamines has a surprisingly large selection of eateries. Crepes and pizzas are widely available as are restaurants serving local dishes. One to try is La Bérangère which is located in the centre of the village. This local landmark has been serving up delicious food since 1912 and has a menu which includes delicious Haute-Savoie specialities. A particular favourite is Tartiflette where local Reblochon cheese, potatoes, onions and cream are combined into a mouthwatering gratin and served piping hot from the oven. Les Contamines has a pretty quiet and relaxed vibe so there’s not the thumping nightlife you might find in larger resorts. However, there are a sprinkling of bars for you to try and for a late night beer head to Le Saxo which offers a warm welcome until 2am or the Tetras Bar for the younger crowd. While there are a few hotels to choose from in the area, Les Contamines is a predominantly chalet based resort. A good selection of self catering accommodation can be booked directly via this locally based website: en.lescontamines.com/liste-des-meubles.html Also there are a couple of agencies in the town you could try such as Les Contamines Immobilier or the local chalet owners directly here. 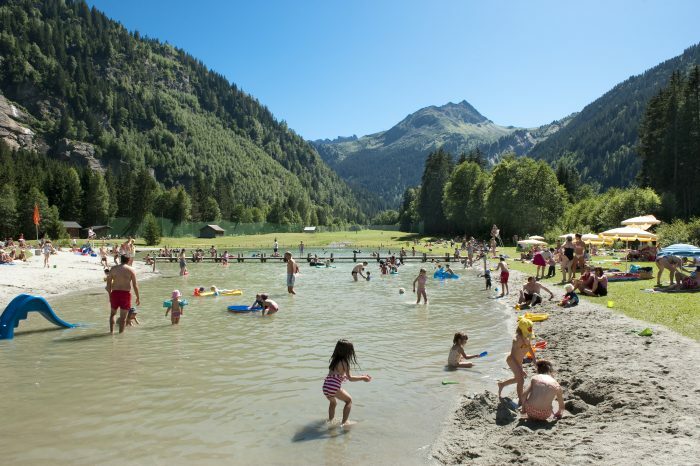 One of the biggest summer draws to Les Contamines is the Pontet Leisure Park which is the biggest natural fun park in the region. Centred around a lovely swimming lake with its own sandy beach, there are over 20 activities to keep young and old entertained. From archery to tree top swings, tennis to trampolining and golf to fishing, this really is a fabulous outdoor leisure complex and highly recommended for a visit while you are in the area. Another innovative activity is ‘Escape Box’. Taking cities by storm across Europe, this is a live action team game where you attempt to escape from themed shipping containers by using your wits and skill to solve clues and complete challenges. The whole of this area is rich in culture and there are some stunning, ancient churches to visit such as the beautiful Church of the Holy Trinity. Immortalised by the English painter Turner, this interesting building dates from 1759 and has survived both the French Revolution and the Napoleonic Wars. Another lovely thing to do to really appreciate mountain life is to tour the many rural museums and working farms in the area. This is a great way to appreciate the Haute Savoie of yesteryear. Don’t miss out on the nature of the area either. The nature reserve of Les Contamines is the highest in Europe and a wonderful place to enjoy the incredible biodiversity of the region. Every Summer Wednesday evening, there is free live music for all to enjoy in the village square. With a really wide range of music including tribute bands and 60’s swing, it’s a surefire way to spend an enjoyable evening. If you are in town on the 15th August, don’t miss the fantastic sound and light show at Notre Dame de la Gorge which finishes with a spectacular firework display. Earlier in August on the 6th and 7th, the local mountain guides celebrate their work with a lovely festival in the town. Learn about the history of the mountain guide service and about the vital work they still do today. A great way for families to enjoy all that Les Contamines has to offer is by purchasing an Activity Pass. These give you unlimited access to the many activities available locally and all at discounted prices. See the Tourist Information office or the Clubhouse for full details. One lovely activity not to miss and a great way for little ones to get to know the mountains is to enrol in mountain bike school. With lessons for all abilities and ranging in duration this is a fantastic and safe introduction to the sport.